Happy morning in the studio. Worked long and hard on the grassy hill textures and colors. 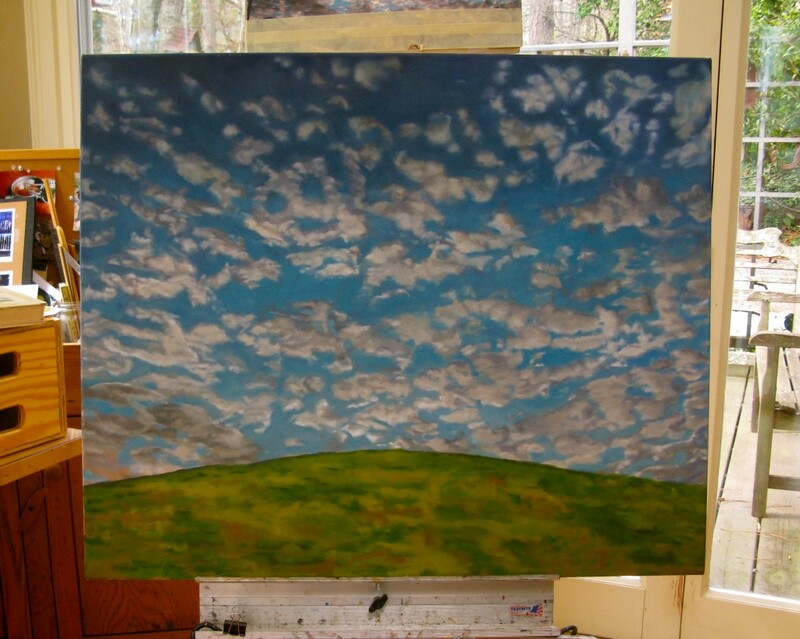 Hope I’ve finished the clouds painting. Now I only have to decide on a title. Cloudy (working title), Fool On The Hill, or 7:30am. I’m leaning toward the last one. This is not a meteorological piece, it’s about the modest feeling of accomplishment upon reaching the summit of a climb, combined with that glory hallelujah moment just after dawn. A sense that God’s in his heaven, all is right with the world. I emptied out three drawers full of source photos, sorted them into series, and stuck them in folders. (Good news for my inner organizer; I bought a five-drawer flat file at a yard sale. Robert is going to attach wheels and I am going to fill that puppy up.) I selected another image from the Metamorphosis series, a version of National Geographics, dominoes and a Magic 8-ball. Here’s the canvas and photo both gridded and ready to draw. Finally, as I was clearing things out I came across a small canvas with the drawing done that I never got around to. The kind of thing that’s perfect for the Small Works shows in December. Figured why not? and knocked out a start. It’s not exactly the same as the source, (pushed the earrings in on the left and the bracelet in on the right), but that doesn’t intimidate me. Ask me again three passes from now. Bound is still wet, so I worked on Cloudy. Lightened and brightened the blues on the lower two thirds, brushed a glaze made of linseed oil and phalo blue over the top third. That’s made the clouds pop a little more, which I like. It seems to be getting a little more surreal, which I also like. Scribbled more detail on the hill grasses. Another two or three rounds should make those marks sufficiently dense. It’s going well. Lightened the lower clouds, trying for those amorphous,bulbous interior shapes, and the tricky, soft edge outline. More fun working on the grassy hill. Started with small, contained spiky brush gestures in a variety of duns and olives, then slathered on big scoops of shaped color. I’m pretty sure that’s going at it backwards, but I like the result. Forecast; fair to partly cloudy. 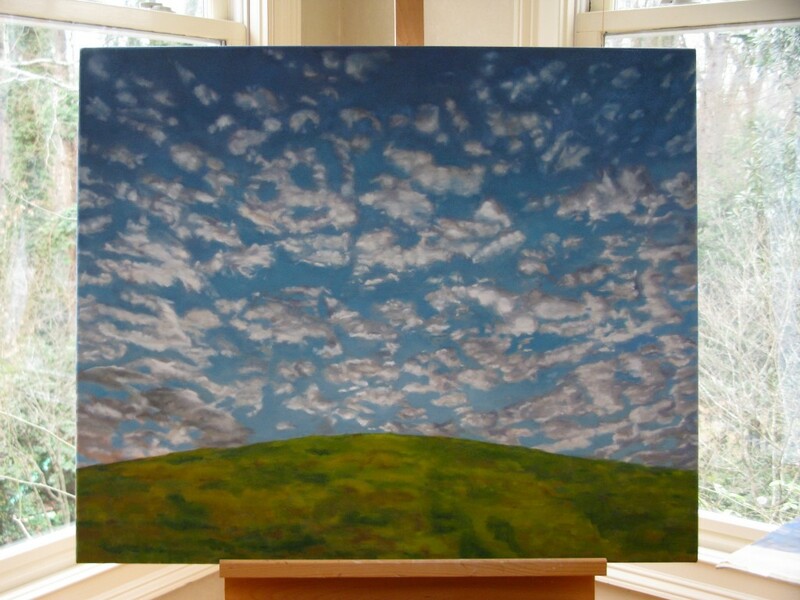 Reworked the hill and most of the clouds on the mid and lower right side. Adding subtle dimension with every layer of paint. A Zen undertaking, when my mind is in the right gear. Back in December of ’07 I had this idea to do a series of big, lush, loose clouds in the heavens. 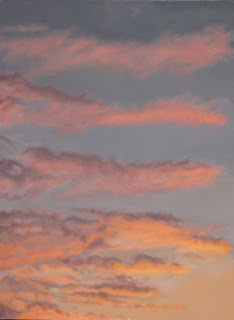 I started with a painting of the Isle of Palms dawn sky, 7:30 am. It wasn’t as easy to paint clouds as I hoped, but I liked it well enough. in fact it hangs over my bed today. 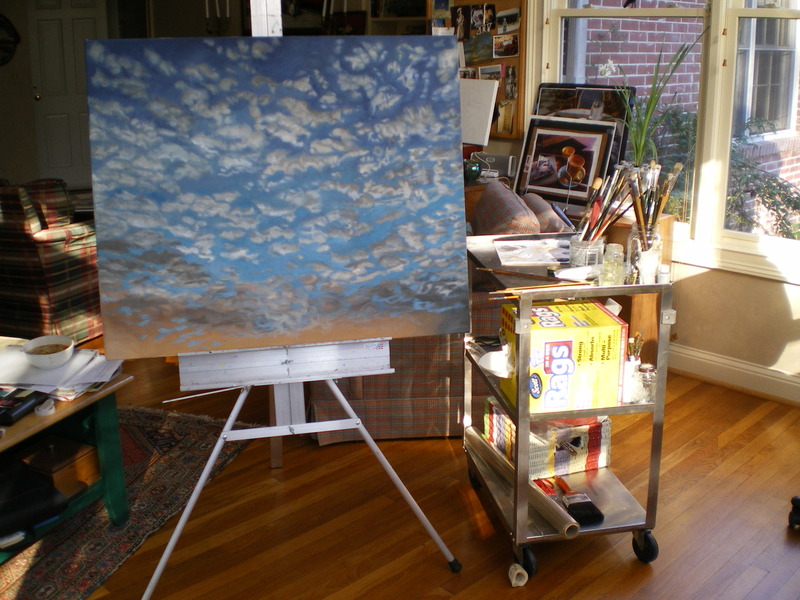 After I was rolling on 7:30am, I started another sky that I loved for its complexity and integral composition, a blue winter morning sky with small clouds. In the original source photo, taken at the busy intersection of West Wieuca and Peachtree Roads, there’s the dark silhouette of a building, some telephone line wires, and dark tree limbs. 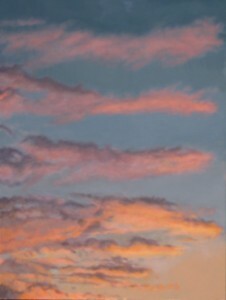 My idea was to paint only the sky. I was going for a sense of immensity and pellucid transparency. 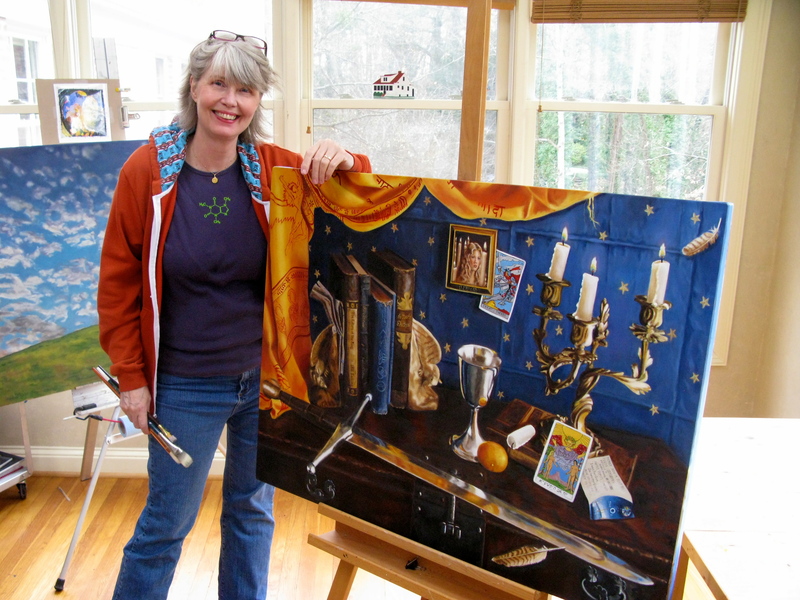 It was on a large scale for me, 30×40″. I worked on for a few months, getting more and more frustrated.I kept losing my place in the source photo when I was working, the cloud edges were all wrong, the whole thing looked like popcorn to me. It lacked…something. I thought about sanding it down and painting over it. Instead, I turned it to the wall. Maybe later. It turned up last week as I was clearing the wrapping paper out of the drying room. I remembered another painting I’d seen years ago, with a hallelujah sky over a grassy hillside. Hey, why not? I found a shot of a hill unencumbered with trees and printed it out, cutting off the sky and the bottom half of the hill with scissors. I tried different prints of the original cloud image and taped them together – ah, old school. 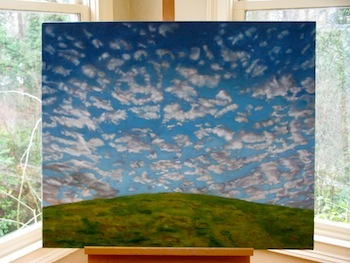 I settled on one where the rise of the hill seems to reflect the arrowed shape made by the clouds. 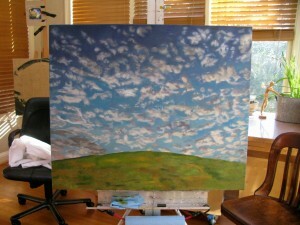 Spent the morning mixing sky blues, neutral cloud colors, and hillside greens, yellows, and browns. Did a few marks with the white charcoal pencil and dove in. 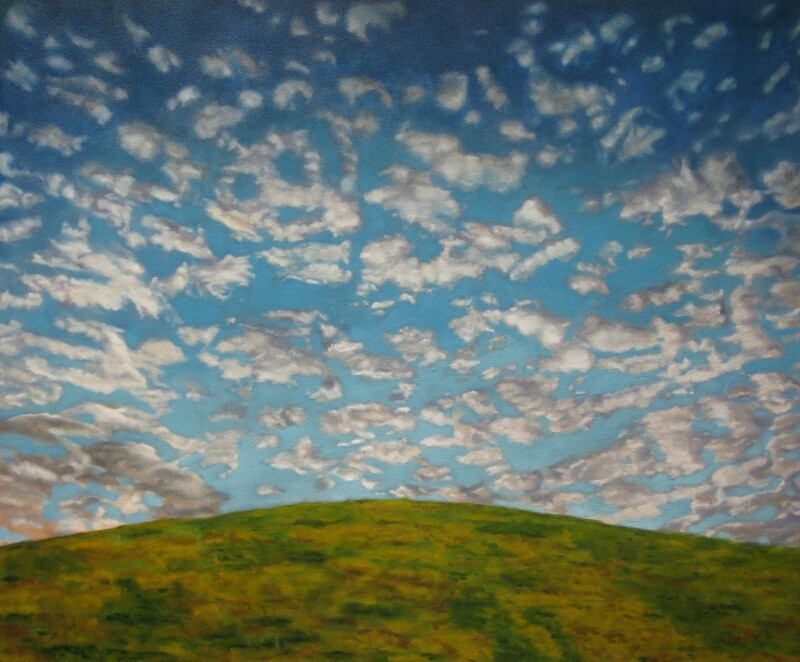 Laid in the start of the hillside, and worked on the center of the sky and some of the middle cloud. Right away I knew I’d found what I needed. No retreat. And never give up. One of the great pleasures of being a painter is choosing to paint what tugs at your heart and your eye. I was seeking a way to make visible the point where the spiritual and physical intersect. The most difficult part was figuring out how to convey the feel of immensity. 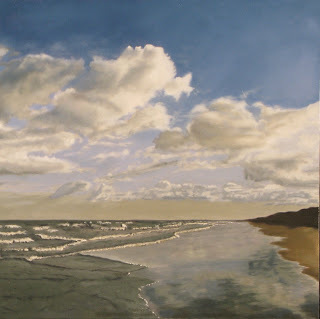 These three sky and sea scapes were the result. They are a gesture gratitude for the chance to be a witness in the world, a valentine to ‘being itself’, to quote Thomas Merton. Added another layer to the clouds and sky, and worked on the surface of the water. 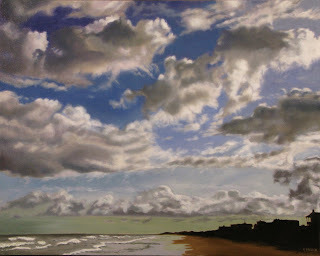 I loved adding the sky’s broken reflection, bouncing off each angle of the surface of the waves. The reflection off the saturated sand is still crude, but I don’t doubt I can get it where I want it to be. Pondering the inclusion of more cloud in the upper right corner. I may just add some semi transluscent wisps. I am drawn to the opposites – the crisp precision of the foam at the edge of the tide, the blurred melting refection on the sand, the stillness of the earth, the restlessness of the water. The invisible wind pushing the great towers of cloud. Here’s a closer look at the waves.